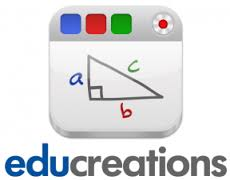 Educreations is a free, recordable, interactive whiteboard app that captures voice and handwriting to produce highly effective video tutorials. Once published, the tutorials can be accessed through a mobile device or desktop computer. We use it in our classroom to create tutorials in Math so that we can reference it at home if needed.